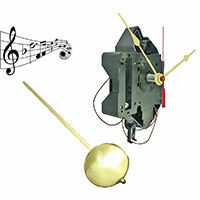 Why order a mechanical clock movement? 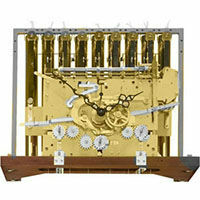 When you receive a new movement it is the same as you're old movement, so all clock components usually fit on to the new movement with no trouble. The cost of a new movement is usually the same if not less than a cleaning on the old unit, and when it's installed it should last another 25-30 years without thinking about replacing or servicing it again. Some new units have bronzed bushings in key wear areas to increase the life of the movement, and on the non-pendulum units the balance has been improved upon for longer life and ease of timing. 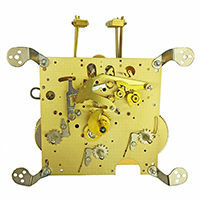 We here at Clockworks offer only the highest grade mechanical clock movements and they come with a 2 year warranty. What happened to the old clock movement? This wear takes place in the holes that are in the brass plates and is hard to identify sometimes. These holes in the brass plates become oblong instead of round and this pinches the pivot arbor going into it. 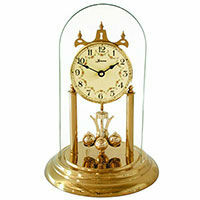 Between this, and the solid oil, the clock ceases to function. To have this repaired is an expensive and long process. To have a mechanical movement serviced can cost hundreds, if not over, a thousand dollars and in some cases it can take weeks to complete it. If the clock is made in any other country such as USA, France, Korea, or China, then you need to contact us via email with pictures of the movement to [email protected] so we can try to help with either a repair or replacement. The second thing to do is to use the numbers that are on the back plate of the German mechanical movement to determine who manufactured it. Using the examples below, narrow down the manufacturer of you're movement and go to that clockworks.com web page to order. When you get to the proper movement on the website, do not worry if the picture is not exactly the same as what you have. 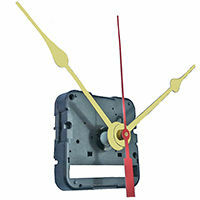 The matching of the mechanical clock movements number is what makes the difference. If the old movement number matches the one on the list, then you will get that exact same movement. 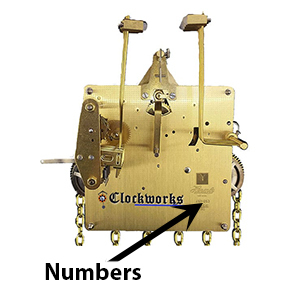 The movement numbers also usually tells us the way the clock chimes, where the chime hammers are located, if it's weight or spring driven and much more. So with the movement numbers we can have a replacement clock movement that is not a knock off version, it is the same movement that was made the same as the old one. Usually all the old parts such as the clock weights, pendulum and hands will all work with the new movement, as the new one will be the exact same thing as you're old movement. >Back in the old days, there was a company who sold many mechanical clock movements out of Plymouth Hollow, CT and so they changed the name of the town to Thomaston, CT after the company. So now if the clock is very old and made in the USA with an ST marking in a diamond shape, then that is an original Seth Thomas and there would be no replacement movement for this. you're only option is to get this repaired. If the Seth Thomas mechanical clock movement says made in Germany, then use our list to see what the real clock movement numbers are so you can price it out and order it. 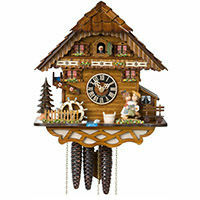 The thing is, the company did not produce any modern clock movements however there name is marked on them as their own. So if the clock says Seth Thomas but it was produced after around 1960, then it is made by someone else with the Seth Thomas name. If the movement says made in Germany and there is not much information on it but just numbers similar to the ones listed, and it's chain driven with a wood stick pendulum, then it is a Jauch mechanical clock movement that we can usually provide a retrofit for. The number one thing to know when identifying your movement are the numbers off the back plate. Getting these numbers can be annoying since your clock movement is probably in a case. We suggest using a little compact mirror to view your back plate or simply putting a camera phone on flash and taking a photo will work too.